Experience our most innovative and imaginative ship yet, Oasis of the Seas. This new class of naval-engineering genius features the first-ever neighborhood concept where everyone can find their unique experiences in one of our seven distinct onboard districts, including: Central Park - a public space combining nature and nautical; Boardwalk - dedicated to family, fun and featuring the new and entertaining AquaTheater; and the Royal Promenade - the heart of many Royal Caribbean ships, that's now bigger and better than ever. With 28 ultra-modern loft suites and 2,700 spacious staterooms, this 16-deck marvel proves that the impossible, is possible. 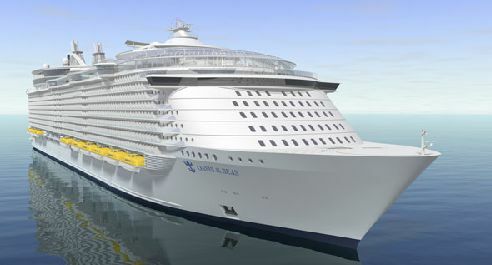 You have to see it to believe it on the RCL Oasis of the Seas cruise ship. Pros: Much to do at all hours. Cons: Not crowded with 6000 passengers, but "busy" on deck 5 always. Have been on 30 or so cruises. Usually like ships of 600-1200 passengers. Tried this big one just to see how it went. We loved it. We have already booked on the sister ship Allure for 2015. On checking my credit card account after the trip I was alarmed to see I had been double-billed for eight items, over $300. An e-mail to Oasis produced a respone that this was standard practice. The problem was solved when a RC lady held a conference call with me and MasterCard and the items were deleted. I cannot accept that this is standard practice and am sendng this news to the Miami Herald travel trouble shooter. Pros: So much to see and do, there wasn't time to be bored. Cons: The large amount of outdoor areas made the indoor areas crowded when it rained. We had 3 women in an ocean view balcony room, and it wasn't nearly as crowded as you'd otherwise expect. The person sleeping on the sofa bed said it was extremely comfortable, and the bed was converted back to a sofa during the daytime by the cabin steward. The only negative for the cabin is, there wasn't enough storage space for clothes. There was a ton of hanging space, but we didn't have that many things to hang. It would have been better to get a second set of shelf cubbies and lose 18" of the closet. For 2 people it probably would be just right. The food was absolutely fantastic. We usually picked up breakfast at the Park Cafe on Deck 8. The Main Dining Room had delicious options every night, and also for the one time we had lunch there. We had lunch at Giovanni's once and at Izumi's once, and both were well worth the charge -- I'd love to go to either one in the evening, too. For entertainment, we saw the musical Hairspray and loved every minute of it. Same thing for the ice show, the aquatheater show, and the Cirque-du-Soleil style "Come Fly with Me" show. The comedians had us in tears, they were so funny. Clearly, the Oasis has a pretty big budget for entertainment and costuming, as these shows were far beyond what we expected. One afternoon, we even watched The Adventures of Tin-Tin in 3D digital in the Opal Theater. There were so many pools that it was wonderful. And the fresh water in the pool was a big surprise, as there had been salt water on prior cruises. Even on the beautifully sunny days at sea, there were always chairs available on decks 15 and 16. Central Park was a favorite spot, and the lush growing trees, plants and flowers were just delightful. Make sure you check it out after the sun goes down, as there are twinkly lights through the greenery and the best photo ops on the ship are there. It was an absolutely fantastic ship. This was my third cruise on Royal Caribbean, but the first time on Oasis. I now feel spoiled for anything less! Pros: Friendly staff, great diversity of food, lots of daytime activities. Cons: Some activities we wanted to participate in were too late at night for us. Even Hurricane Thomas couldn't put a damper on this cruise! The captain and crew had to change the course they sailed, causing us to visit the Bahamas on Day 7 instead of Day 2. The hurricane had an effect on our St. Thomas tour, in that Megan's Bay, touted as a Top 10 Beach in the world, was just an ordinary beach, but I'm not going to complain! The ship activities were great, an endless buffet of events to partake in, according to your interests: Sports, trivia games, scavenger hunts, music, dancing, skating, swimming, sunbathing, etc. My only complaint is that there were a few activities my wife and I had to miss because she was too tired to watch! Speaking of endless buffet, the Windjammer Cafe was available all day for your eating pleasure! Central Park was beautiful, and romantic. Chops was an excellent restaurant, and there was so MUCH food!! Thank goodness for the Fitness Center!! The Comedy show was great. My wife and I don't do musicals, so no comment on Hairspray. I would definitely recommend this ship to everyone, and if you eat in the main dining room, ask for Henry as your waiter. Very friendly, and entertaining! It was great just walking on the ship, visiting the different venues: Boardwalk, Promenade, Entertainment Place, Sports Deck, etc. People-watching was great, too. Pros: The ship is the destination! We booked this 8/2009 as soon as we got off the Enchantment's 8/22/2009 Western Caribbean cruise. This was our 20th overall cruise, eighth with Royal Caribbean. Marissa, our DD14, and I flew from the White Plains, NY, airport on Friday 8/20 to Fort Lauderdale. My last day of work due to a reduction in work force, what a way to start a vacation and a new journey into life. Stayed overnight at the FLL Airport Comfort/Sleep Inn, had to wait about 40 minutes for the free shuttle from the airport to the hotel, worth the $62 for the room and free breakfast. Saturday morning, took the 10 a.m. hotel shuttle to the port, only ones on the shuttle. Boarding Dropped off curbside around 10:20, sitting upstairs in the Platinum area of the lounge at 10:28...just excellent turn around time for check in! Ship finally cleared for boarding, and there we were, sitting in the Park Cafe having their famous roast beef sandwich at 11:25 a.m. The Ship Yep, we did the 'WOW' when entering our home for the next seven days through the Promenade. Ship still looks pretty new after almost one year of service. Did notice wet areas of carpet that the crew were trying to clean. Nice works of art throughout the ship, Central Park and the Boardwalk were very nice areas, the Solarium was very hot at all times during the day, with a very small pool. Pool decks awesome, favorite pool was the beach pool with umbrellas. Usually crowded and most time had to find chairs either way back from the pool or topside on deck 16. Elevators were usually hot and packed about 50 per cent of the time, and when packed, and trying to get off, no mercy shown by those trying to board. Twice did we come across teens playing the old "ride the elevator" game who had pushed every button making us stop on each floor one night when trying to get from our cabin on deck 14 to deck 4 for the dining room. Smells and other funky Stuff: Yes, during the whole cruise there was a sewage smell on various decks and white fluffy stuff floating around and accumulating on the top outside decks...due to the ship farting? Fellow Passengers: Generally well behaved, although we experienced being pushed out of lines in the Windjammer, store counters, at railings, while watching some of the Promenade shows, being met with a 'Deer in the Headlights' blank eye stare when voicing our objections, sometimes the verbal response sounded like: 'La cata gotta la rata', spoken at 1,000 words a minute. Our Cabin: A D6 Aft 'Hump' balcony on Deck 14, #14274 - Beds by the balcony, small, no room between the beds, tight squeeze between the beds when trying to get to the balcony. Storage just okay, good bathroom design though. Obstructed balcony in my opinion due to the overhang and side steel plates supporting the ships superstructure of deck 15 above. I would not recommend this cabin if you covet great balcony views. Also had banging ship noises the first three nights at 5 a.m. that did disappear for the rest of cruise. Staff: Stefan was our steward. He looked like the walking dead when he knocked on our door at 3 p.m. Saturday to introduce himself, although during the rest of the cruise, he was always charming, funny and efficient, ensuring our cabin was tidy, my bucket of beer always filled with ice, the room service plates cleaned up, and the cabin stocked with the basic items and towel animals. He got a extra tip! Wait Staff: Just okay, their main dining room service significantly depreciated the last two nights of the cruise; they got tipped accordingly for this. However, they had no problems always satisfying my wish every night for two starters and entrees. They got tipped accordingly. Bar Staff: Just great, no matter where we went to get Marissa her unlimited supplies of Shirley Temples off of her soda card, or my buckets of beer and whiskey on the rocks. The Food: Main dining room just okay focus seemed to be more on gourmet presentation than quality and taste during preparation. Although most sea food dishes and their Black Angus steak, which you could get every night, as well as the desserts, were always good! Windjammer (Lido): Always crowded, design flaw for crowd control in my opinion with their multiple little stations for hot, international, Asian, salad, and fruit stations. Ninety per cent of the time you could not find a seat. Their last lunch on Friday was good comfort food, wings, BBQ Ribs, pasta and meat balls, etc. Johnny Rockets: Great breakfast, get the 'WORKS'! The Shows: Okay, the Oasis of the Dreams Aqua show got canceled for the entire cruise, our reservation was the first night (Saturday) and was replaced by a "variety show" show featuring the Unexpected Boys (unexpected that they had to go on stage...LOL)...Not too bad, especially as my DD14 got pulled on stage as the second girl, while they crooned "My Eyes Adored Her." Not sure, but this might have been the highlight of the cruise for her. Replacement Oasis of the Dreams Aqua Show: abbreviated 30-minute show, watched it three times from the 'secret' 14th deck floor location, was worth it just for the the high divers! Hairspray: Awesome! This 90-minute show went by so quick, it was that good! Headliner Show: Kenny James, he of the one-hit wonder group the Hughes Corporation and their song: 'Rock the Boat.' High energy song and dance show covering Motown...actually not too bad. Ice Show-: Compilation of Hans Kristen Anderson stories. Awesome. The Sand Show stories were the highlight! Come Fly With Me: Excellent! Get there early to see your cruise director Richard Spacey's Evolution of Dance routine. Sit upstairs in the balcony for the best view! Labadee: Hot, but when is Haiti not Hot? Heat index was 115 degrees! We did para sailing and the dragon coaster, more like a dragon tobaggon where you got to control the brake and you speed down the mountain. The BBQ lunch had awesome BBQ ribs and jerk chicken. Did not venture into the market to get hassled by the vendors (been there and done that). Did the short walk to Dragon's Breath...cool! Two thumbs up and a snap to RCI for redeveloping this port! Costa Maya: Our favorite Port! The captain was able to dock his first time. The seas and winds were really high! (I've read after three attempts to dock, the ship moves on to another port). Spent about one hour at the port facilities near the pool, under a palm tree, getting sprinkled twice by a tropical storm (so refreshing in our bathing suits), enjoying some cold drinks, looking and listening to some local dance and music acts and browsing the shops. The highlight started when we boarded a large A/C bus for $3 each into Mahahual and the Malecon to a pristine beach across from the El Faro Restaurant...drop dead gorgeous beach with many palms, white sand, and clear, calm, clean, Caribbean beach! Not to mention spending 90 minutes here and our tab being $8 for two sodas, two Dos Equis beers and local tequila on the rocks. Marissa had three personalized bracelets made for $15 to share with two of her best friends that just started high dhool today. *Do note: When you tell your taxi driver to take you back to the port (at $2 a ride), you will get dropped off at a little town and shopping complex right near the port, surprise. Their prices and selections are rather good...albeit with a short walk back through the port and to the ship. DID I SAY THIS WAS OUR FAVORITE PORT OF CALL? Cozumel: Our sixth time here, under strict orders from Marissa this was not to be a beach port of call...which I had no problem with. We took a taxi for $7 to the Forum/Los Cincos shops and walked back down via the sea wall through San Miquel and the Town Plaza with great views of the NCL Epic docked in port. Alas, Sally's Mini Golf is no more, a true Oasis in Cozumel...sigh? We then caught a taxi cab back to the ship...having luck to catch both taxi rides during tropical rain storms. Do note: The Cozumel taxi drivers play the "no change" game. But when I started to walk off to look for change, they finally whipped out their wallets filled with multiple $1, $5, and $10 bills. We re-boarded the ship and actually got a seat in the Windjammer for lunch, then swam in the deserted beach pool, got massaged in a deserted hot tub, took a shower, and then went back into town, and snorkeled at the Senior Frogs beach and shopped for trinkets at the International Pier Shops....our second favorite port of call! Disembarkation: The best we ever had! We were staying overnight in Fort Lauderdale the Bahia Mar Yacht club and asked Stefan our cabin steward for a late check out number. He gave us #75. We actually slept late Saturday (due to roaming the ship after midnight and taking photos) and left cabin #14274 at 8:05 a.m. for breakfast in the MDR (lines on the right get a la carte, lines to left get buffet). We finished breakfast at 9 a.m. and were told all disembarkation numbers had already been called...so off we went back to reality with a short wait to find our luggage and clear customs...JUST BRILLIANT! Took about ten minutes to sign papers to get on board, no hassle or waiting. Rooms were spacious, from there on in was one site bigger then the next...Central Park to Boardwalk, through the Promanade to the Aqua Theater. One amazing experience after another. The show reservation system is the greatest, no overcrowding, everything just moved without a hitch. Would not hesitate recommending or going again on Oasis of the Seas. From the moment we were efficiently processed through the gorgeous new Ft. Lauderdale terminal, until we boarded for the Dec 2009 7-day maiden voyage, and were touch-screen guided through the "neighborhoods" to our 10th level, port cabin overlooking the Central Boardwalk we were filled with excitement! Admittedly, we were sailing with only about 3,500 of the 6,400 full capacity paof ssengers, but there were no waits anywhere, and the design of this massive vessel felt comfortably managable. The impact resistant sliding doors provided complete sound isolation from our balcony-adjacent two rock walls, overhead zip line, incredible high diving, sychronized swimming, laser light shows in the Aqua Theatre (over which was the ocean view), two Flow Riders, Carousel and Boardwalk arcade shops and restaurants below, and high energy two-story Dazzles nightclub (that was illuminated at night) below the bridge-spanning Windjammer dining area with illuminated two-story townhouse cabins above! Only a few design flaws were noticed. The cabin space was tight with a sliding door closet too close to the bed and its safe which you had to sit on the bed to access, and the electric outlets that were located on a side wall that you had to crawl under the desk to reach. The incredible fitness center was placed on a lower level (more stable but without the great views).You had to go down a long hall and winding uncomfortable glass staircase to access the locker rooms. They had no large steam or sauna rooms. And their showers had only cold water (despite numerous service calls) and were tiny with inswinging glass doors that rendered it nearly impossible to get into them and turn on the icy cold water! The main dining room was impressive and on three levels with interconnecting balcony overlooks. But as the levels are not connected by a grand (or any) staircase, you lose some of the impact of the multi-level dining areas of the other RCCL ships. I'm not a gambler, but I did check the lower level casino. Between the "gas release" from the carpeting and the allowed smoking, I thought you'd have to love gambling to tolerate the poor air quality. The themed swimming pools were terrific...but their decorating needed some softening and enrichment. Their surrounds were stark and underwhelming compared to the richness of the other spaces. The bow multi-level glass-enclosed jacuzzis, fountains, and sunbathing retreat was wonderful as was its healthy-choice restaurant. The garden atrium space was a peaceful retreat during the day, and magical experience at night. The entertainment everywhere and at all times was wonderful and varied. The artwork was an experience unto itself and the guided tours of it were enriching. The entire staff from captain down was top-notch and went overboard to add to the overall experience.